Whether at work or at home, your environment is much more pleasant if it is clean and organised. Whenever an office is disorganised or is in need of a good deep clean, there can be a negative impact on the business, as workers become unhappy and the company becomes a lot less streamlined and productive. It’s a proven fact that working in a disorganised and cluttered space dampens creativity and productiveness, so anything you, as an employer, can do to limit this impact will pay dividends for your business. Which is why, although a seemingly small part of your working week, selecting the right cleaner is vital. But before you pick, there are a few pointers to follow to make sure the company you select are the right ones for you – whether you’re considering hiring them to clean your work or your home. Cleaning is more than throwing a duster and hoover around every week or so. Specialist cleaning firms will be able to discuss your cleaning requirements for your office space, and also are trained in the best products to use for each surface. They will treat your property with respect and care. The right firm will advise you on which areas would need to be cleaned on a weekly, monthly or annual schedule, and create a plan, just as you would have with your own home, to make sure everything is hygienic and, importantly, health and safety compliant. This could consist of making sure the high use areas such as the bathroom and kitchen are cleaned on a more regular basis, while others with lower use, or items like carpets and windows, are scheduled in less often. You wouldn’t let just anyone into your home, just as you wouldn’t allow a stranger on the street to enter your office. Most work environments have cleaners on site out of office hours, and in domestic properties the homeowner is often at work while the cleaner comes in. This means giving unsupervised access to the property – so you have to be certain that you hire a cleaner with good credentials. It’s essential to choose a company that is insured and offers a guarantee that all employees are properly trained and thoroughly referenced, including checking for criminal records. A reliable company will have other clients who should be more than happy to endorse them – so don’t be shy about asking about other customers you can speak with directly as referees, before you sign on the dotted line. They should also have a clear process to ensure your satisfaction. Merry Maids, for example, ensure your premises are checked by a supervisor after the first clean and on a rotational basis for others. They also offer a 100% satisfaction guarantee where they will come back for a free clean if you are not happy with any aspect of their work. You have the highest standards for your own work – so you want to make sure that the cleaning company you choose does too. If you’re after regular cleaning services, don’t be afraid to ask for a trial basis so you can see their cleaning for yourself. You may not need regular cleaning services, but a professional clean can be just what you need. Consider if you are trying to sell your home – or are moving into your new place. A complete deep clean may just make that sale go faster, or help your new home feel fresh and welcoming. If you’ve finished decorating or renovating, your home may be full of dust. Hiring a cleaner for a thorough cleanse – particularly if time is short – just makes life a little bit easier. Hiring a cleaner for your home or business may seem like an expense you don’t need – but it doesn’t need to cost the earth. Choose a firm that has offers for block bookings. 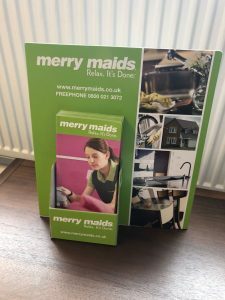 Merry Maids is a family-run business based in office space on the Cookes Storage site in Minworth, close to Sutton Coldfield and Birmingham. To celebrate the summer and their successful partnership, Merry Maids are offering Cookes customers any ‘one-off’ cleaning service for the discounted price of £70 per hour (inc. VAT). The offer includes two maids, all cleaning equipment and a Supervisor check of the completed clean. Alternatively, they are happy to provide a fixed, no-obligation quotation that will ensure that the clean is tailored to your specific requirements. For more details, contact Merry Maids on 0121 313 1005.